This leather case is specifically designed for the Apple iPad 2 . 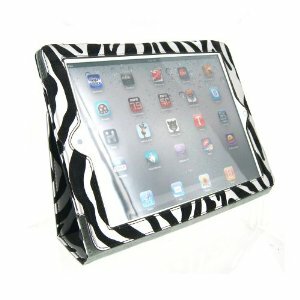 Made from Genuine leather and has a graphic Zebra print layered on top Holds the iPad 2 securely in place, while still allowing the user to access all the buttons, ports, and screen . Velcro straps firmly holds the leather flap closed to make sure your iPad 2 does not fall out in any way . Velvet lining adds a soft touch and takes away any chance of scratching the back of the iPad 2 . Front cover can be converted into a kickstand to watch movies or angled in a way to type or use the iPad comfortably. Intelligent magnet “Auto Sleep / Wake Up” design same as the Smart Cover. Specifically designed for the Apple iPad 2. Made from Genuine leather with a vinyl Zebra design print layered on top. Intelligent magnet “Auto Sleep / Wake Up” design same as the Smart Cover.